Old map by SCHENK -Americae tam Septentrionalis quam Meridionalis in Mappa Geographica Delineatio. . . 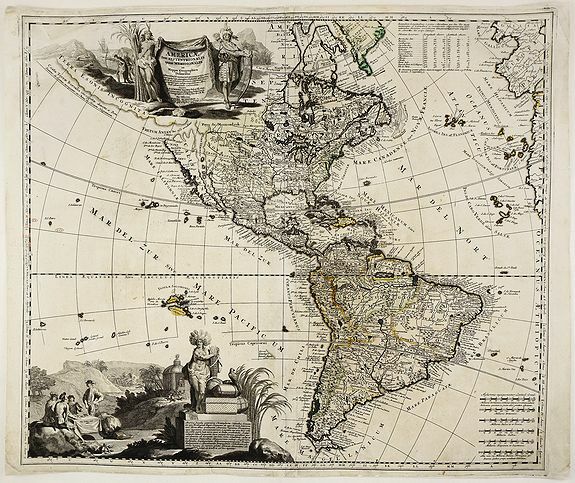 Title: Americae tam Septentrionalis quam Meridionalis in Mappa Geographica Delineatio. . . Condition: In good condition. Cleaned and sized, some spotting, colours faded. Repairs to small tear at centre and to a few small marginal tears. An uncommon and decorative map of America, showing California as an island, published by Zurner and engraved by Pieter Schenk. The map shows a massive 'Terra Esonis Incognita', a vestige of the prior century, when popular (mythical) cartography showed a near continuous land bridge from the Straits of Anian to Japan. The Pays de Moozemlek is shown to the East of the Straits of Anian. Includes two beautiful allegorical cartouches, including a title cartouche, flanked by two Native Americans and large vignette at bottom showing explorers seated around a table, natives worshiping in a temple, and a battle. Latin text enclosed in the cartouche discusses the explorations of Columbus, and Catholic missions.